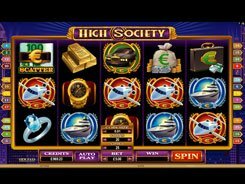 The High Society slot with predominantly black, golden and green colors everywhere on the reels captures perfectly a lifestyle of the rich. Its symbols include limousines, private jets, golden and silver ingots, money in briefcases, money in bags, luxurious watches, and other super-expensive “big boy toys”. 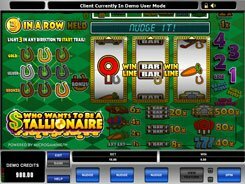 A size of the maximum bet ($250) per spin seems to hint that the slot is only affordable to the rich. But that’s not the case. 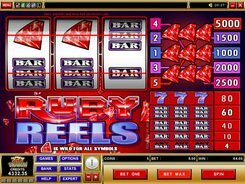 In fact, a bet is very flexible starting with as low as $0.01 per spin. 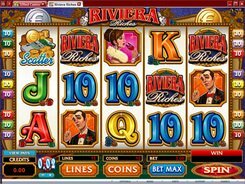 Payouts for regular symbols do impress being in a range between 5 and 3000 coins if you hit three to five matching symbols on a payline. 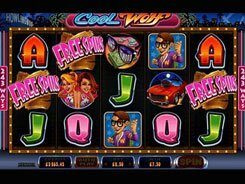 During a free spin feature you stand the chance to win over 1M coins, which is an unbelievable award for any non-progressive slot like this. Once you roll up three or more scatters, you are prompted to pick one of the two bonus features to play. 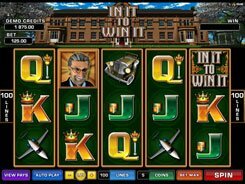 The first bonus option gives you up to 20 free spins and wild reels, whilst the second bonus option gives you 10 free spins with a cumulative multiplier. Whichever you pick, the cash prizes will be truly fantastic. PLAY FOR REAL MONEY!